- Learned how to run backward while carrying a case of Wizard Water©. - Increased my poker game stakes limit so I don’t gamble in excess. after her second visit of the year. - Acquired a new grey coat and top hat. - Practiced not singing when humans, mules or dogs are present. - Ate fewer beans before shows. - Donated a free sample of flea cure to my mother-in-law. - Gave wife a new apron and iron stewpot. for attempt upon my life. of Wizard Water in exchange for help removing a shackle. but also so he has a source of income when he retires. - Encouraged Bleb to eat fewer beans before shows. as well as three silver dollars, my pocketwatch, hat and boots. All in all, it has been a productive year, but there is always room for improvement. I plan to work on mind-reading and faster methods of travel. p.s. Speaking of Dahlonega, I will be visiting that fine town again on the second day of January to host the Mountain Music & Medicine Show. Hope to see you there! 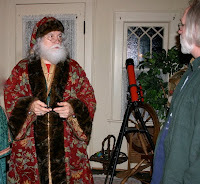 Kris Kringle and I have a friendly rivalry regarding who is the better distributor of goods. Recently I bet him a 20-dollar gold piece that I could transport 50 cases of Wizard Water© from Atlanta to Nix’s grocery store in Dahlonega before he could. He agreed to the challenge and the next day we both set off from from Piedmont Park with 50 cases in each of our vehicles. Well, even with shortcuts it took me a week to reach the mountains of Lumpkin County. When I finally arrived at Mr. Nix’s store, there was Kringle sitting by my cases on the front porch, strumming a mandolin. “You don’t seem very upset,” said Kringle. I paid Kris the gold piece and wished him a good day. I expect to get another bag of coal this year, but the old guy never brings me the trick dice I ask for anyway. Dedicated to Tony and Ann. Rub yourself all over with Wizard Water©, including your scalp. 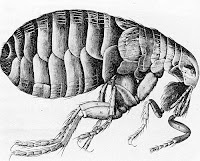 In a few minutes the fleas will grow so large you can knock them off your body. Have a pistol handy to dispatch them quickly. Be careful, though, to use just enough Wizard Water to dampen your skin without getting soaked. I knew a fellow who filled a washtub with my elixir and immersed himself in it. The tiny vermin grew so large that they filled the tub, and he was squashed to death. You may ask, “Why don’t the people who take this flea treatment also experience a spurt of extreme growth?” The answer: Because fleas are so much smaller than humans yet unable to shut their mouths, they ingest far more Wizard Water per body weight than any human can hope to swallow. The flea’s metabolism, already rapid, accelerates at an abnormal rate, enabling easy disposal for those with good marksmanship. If you abhor violence but are good with a rope, once these pests have grown large enough you can also lasso and sell them. Some cowboys prefer to practice their bronco-busting on oversized insects and will pay good money for a herd. Do not expect help from your dog in this matter, however. Dogs trained to herd cattle pay no mind to fleas. They say that animals talk on Christmas eve, and if you happen to be nearby you can hear them speak. Well, about midnight one December 24th a few years ago I was bringing Bleb into the barn, when suddenly he asked me in plain English for ten dollars. He went on to explain that he wanted to enter a mule race the next day, to impress a certain lady mule he knew. "Are you shocked to hear me speak? asked Bleb. "No, I just didn't know that someone was holding a race on Christmas day," I replied. "Thanks for the tip." I entered Bleb in the race, but I bet on another mule. Bleb lost, I won, and he hasn't spoken to me since. Speaking of surprises, I'm preparing one for my wife this Christmas. I've been feeding whiskey to her prize milk cow. Any day now I expect it to start giving eggnog.